Any backpack while camping or hiking is considered a variation of a survival kit. Hikers and campers tend to pack only the most essential items, without which survival may be impossible. If you’re driving to your campsite, it is quite normal to bring BBQ, bulky cooking stove, etc. If you’re hiking or camping entirely on foot, then these items are more of a hindrance than of any significant use to you. It may even expose you to more risk. One may believe that the minimalist’s survival kit is ideal for most people, but these kits will lack items, which may be of higher value. We will talk about the camping survival kit, which is the ideal tool for survival out in the wild, while camping and relaxing in the nature. The items we will include will take into account potential situations, for which you absolutely must be prepared. According to Mike Forti, who graduated from the US Air Force Survival school, the large backpack is a large survival kit for a comfortable several-day camping. The minimalist survival kit will bring you a lot of discomfort and make your stay miserable, although it will provide you with the bare essentials. 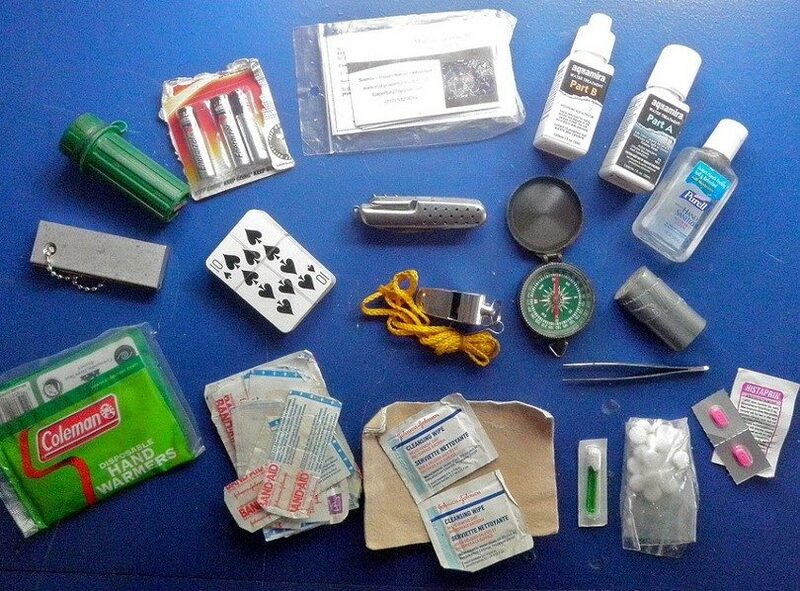 Here is a list for you to check on the most valuable items for your survival kit inventory. 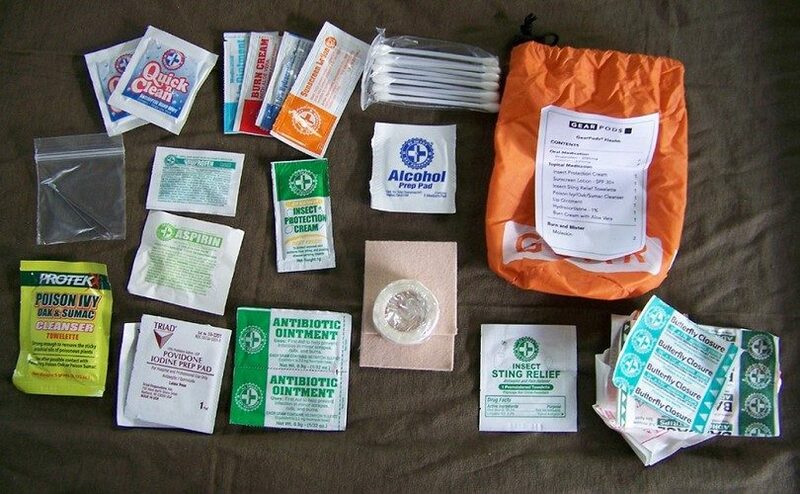 You need to assemble yourself or purchase a ready-made first-aid kit. You shouldn’t venture out in the wild and plan on spending more than a day without a first-aid kit in your backpack or van. First-aid kits have all sorts of bandages, gauzes, sterilized tissues and gloves for instant use, etc. 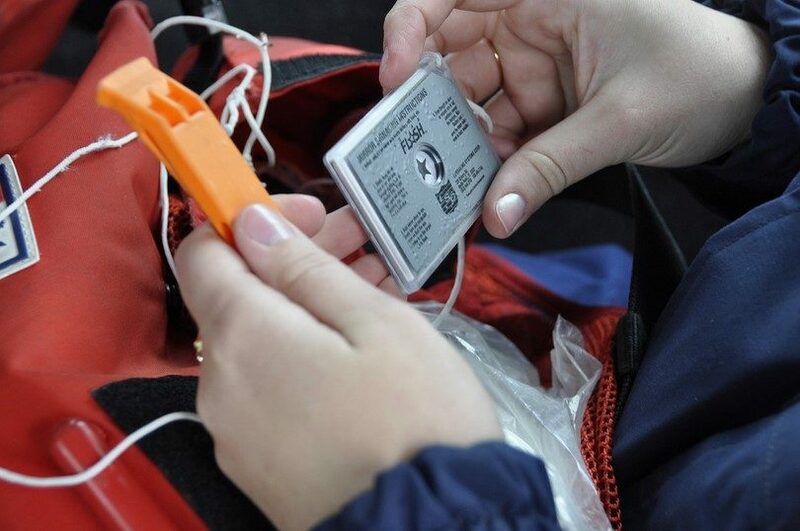 See our article review of the best first aid kits to give your more choices. You can also add sewing needles and very thin cords, antibacterial creme or wipes, over-the-counter painkillers, personal medications, etc. You can purchase a first-aid kit from any popular shopping center at a very low cost. Make sure not to purchase a large medical kit, or it will become more of an inconvenience rather than help. The water bottle or container is of crucial importance. Even if you bring your own water with you, some accident may occur and you may lose that water, or drink it, and be left with nothing to drink. Bring an aluminum water bottle or other light-weight water container or even a canvas sack. Unfortunately these canvas sacks may easily be punctured if you handled it carelessly, so keep that in mind. The Camelbak water bottles are a great way to store the water, and have them light when empty. Also, some aluminum water bottles have the option to be attached to a carabiner, thus making them easy to access and use instantly. You can also check out the best reusable water bottles for more insight. On the topic of water, we need to point out that not any water should be drank. You may think that water in the nature is clean and safe to use. While there may not be chemicals in the river as there are in the tap water, there are still other risky factors like microorganisms, viruses, bacteria, dirt, etc. You shouldn’t drink water from the nature, unless you’re camping at very high altitudes (where the risk for water contamination is minimal). Camping in the altitude of the forests means that animals drink from the water. There may be excrements (contaminating the water) or even dead animals. All of these factors contribute to the unclean waters in the wild. While the water itself may seem clean, the bacteria and viruses are invisible to our eyes. So, carry filtering systems, or better yet – purification tablets based on iodine or chlorine. 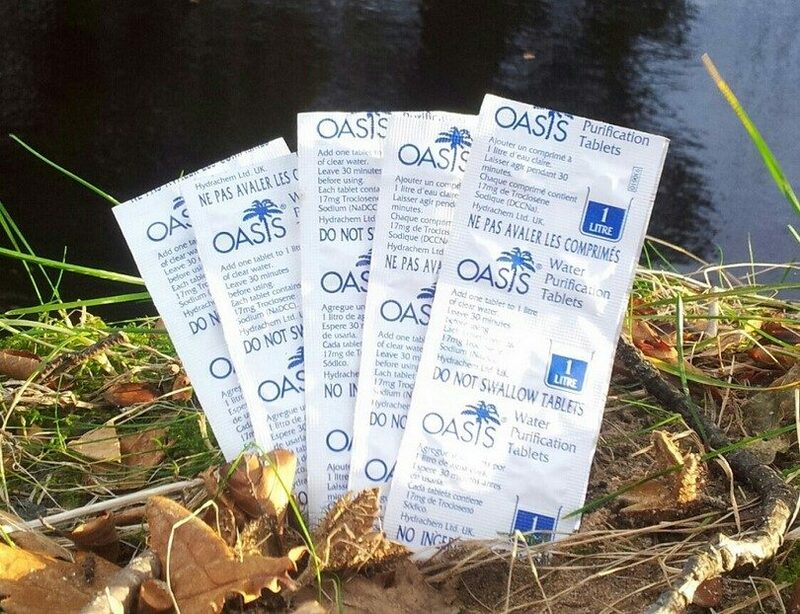 These neutralize any organisms or viruses for a period of several hours. 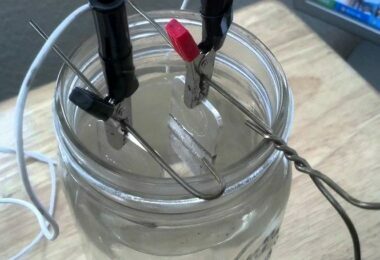 If you use a tablet now, wait for it to do its job for 30-40 mins, and then drink the water within the next 4-5 hours. This is because bacteria and viruses may reactivate again and you’ll have to purify the water again. See our review of the best water purification tablets to give you more options. While navigating using a map and a compass may seem challenging at first, it may be extremely important to learn using them. Even if you’re simply camping and just want to enjoy your stay at the campsite, you don’t know when you’ll decide to explore the area for an hour with your friends, kids or alone. For tips on how to choose the best compass, see our article on the subject. If you do that, you definitely shouldn’t go out there without the most basic tools for navigation – a map and a compass. These can literally save your life and get you back home (or your starting point). So, learn to use them and don’t underestimate their importance for your survival. When it comes to shelter, there is ‘The rule of three’ – you can’t survive for three hours exposed to harsh weather, for three days without water, and for three weeks without food. So you can see how important it is to give yourself what your body needs – dry warm conditions in the shelter you make yourself. Your shelter can be built by anything. You can make it out of branches and foliage, or you can make your life easier by getting a tarp or a space blanket or even a garbage bag. Either of these will be great if you use your imagination, and will meet some basic requirements for you to survive. This is why it would be great if you bring along rope or cordage of some sort, so you can better manipulate the tarp/shelter type to your needs. A simple lean-to can be built very quickly with a tarp and rope, and will save some time. You can hunt instead of building foliage shelter from scratch. 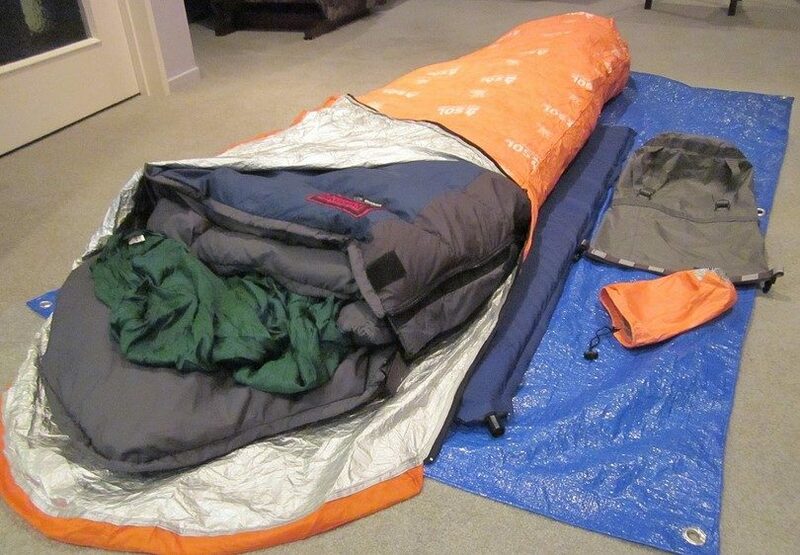 An additional idea is to use your sleeping bag or bivy sack to protect you from the weather. The only downside to this is that these get wet quickly. But if you have a shelter and a sleeping bag together, it can definitely bring you much more comfort and warmth. Basically, sleeping bags have this strong positive side that they can save you in you suffer hypothermia. Space blankets can also retain the heat of your body and thus are a much better option for light camping. Even if you’re camping in your van, you must be prepared for cold weather and unexpected situations. This is why you must also consider some space in your backpack or van for warm clothes. You may never use them, but they must always be there in case you need them. This is true even for summer camping. You should never go out there without spare socks, hat, mittens and gloves, warm underwear, water-resistant jacket and pants. The water-proof boots are an absolute must. You may think that camping is a secure and safe way to relax in nature, but if you wander off in the nearby area and some cold rain catches on to you, you may suffer hypothermia until you get to your campsite. Accidents may happens around frozen lakes as well, or you may have to save someone, etc. The hypothetical situations may be too many, but having extra warm and reliable clothes doesn’t cost you anything but a few additional pounds in your backpack or van. Of course, if you’re driving, it is easier to pack along clothes, but as a backpacker, you need to plan your inventory well beforehand. Yet, don’t ignore the need for extra clothing and make some room in your bug out bag. 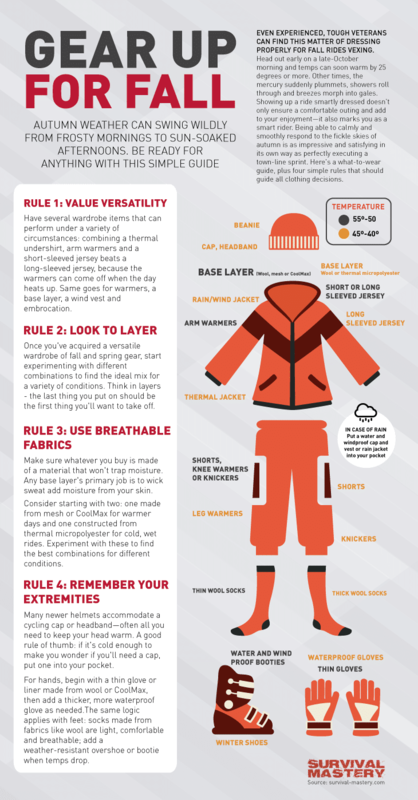 A final advice on clothing – get more synthetic clothes and make sure these are the layer closest to your skin. Synthetic material is breathable and dries quickly. It also keeps your skin well ventilated and reduces the sweating, because it evaporates. Cotton or wool clothes will keep you warmer, but they get dry much slower. Wool can remain warm even if it’s wet. Make sure you have at least two layers of additional clothes – one synthetic layer and one warm (cotton/wool) layer. The jacket should be the last top layer. As we’re talking about warmth, we should point out that the skills and ability to start a campfire may be of vital importance. You may have a quick fire starter and purchased kindling, but if you run out of that pre-made kindling/tinder, you have to rely on your own skills. Get a reliable fire starter or basic lighter, and don’t forget the traditional matches. Any of these may be your savior. Along with that, put some tinder or cotton balls and vaseline in a Altoids can. Make sure there’s no way for water or moisture to creep in and ruin your chances for a warm evening. Practise starting a fire in safe conditions and figure out how you can improve your skills. The flashlight is not only a means to show you the way in the darkness, but also a good signaling tool. If you like camping you probably enjoy lanterns and larger light bodies, but it’s nonetheless crucial to have a more mobile and compact version of these items. A flashlight or a headlamp are ideal for this. Even camping in your car, you may still need to go out in the dark. You can immediately put on a headlamp and you’re ready with that. In case you need help or are waiting for a rescue team, the flashlight/headlamp can become a powerful signaling tool. The whistle and the signal mirror are partly similar to the flashlight in that they can help your rescuers locate you. These are traditional items that will never need to be recharged, will never run out of fuel, etc. They can function as long as you’re capable of using them. The whistle will give out audio signals. If the rescue team isn’t able to locate your from above, they may be on land. As long as you give out regular whistle signals, they will be able to very quickly locate you. The signal mirror is great during the day, especially when it’s sunny. You need to learn how to use the mirror and how to focus the sun beam to the correct direction. The mirror can also be used to confuse an enemy or even temporarily blind a wild animal and have several seconds to escape. 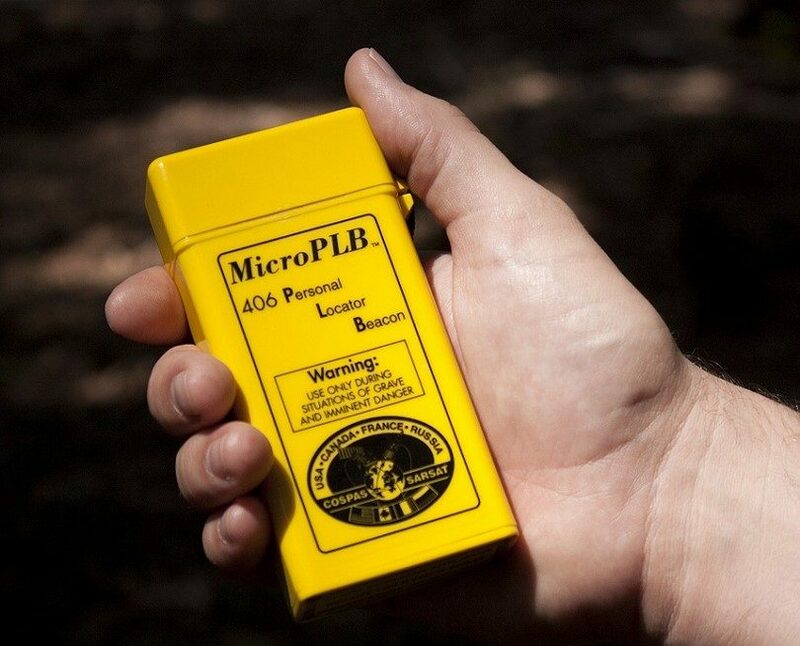 The Personal Locator Beacon or PLB is an electronic device which regularly sends out your current location. Some such devices provide you with the option to send messages through a satellite connection. This means of course, that you will need a clear sky to successfully send your exact location and coordinates, but it will still work even with a cloud cover between you and the satellite. Some of these devices can be connected to a smart phone, and you can send messages in that way. You can let your relatives or friends where you are at certain times, so they know often where you are on your way. This is of course ideal for hikers and trekkers, but it can be invaluable if you’re camping, but wandered off and lost your way back. This gadget should be part of any camper’s or hiker’s backpack inventory. When talking about connection it’s important to mention the cell phone. Most people prefer using smart phones whenever they are camping. Some carry solar chargers and rely on those to recharge the constantly hungry smart devices’ batteries. But what will happen if there’s no sun for several days and you still need help or need to call some relative or a friend? Cell phones’ batteries are still much more reliable because of the lack of any fancy animation and color to power the screen. A cell phone’s battery can be alive for a week on average. If your smart device’s battery dies, you can use the cell phone and call an emergency phone or a relative. You shouldn’t underestimate the necessity of having a cell phone. Keep it either turned off or on airplane mode (if it supports it) when you don’t need it. This will preserve the battery for longer. Reading up to now, you may wonder, what about the food? And you’ll be right. We may not be talking about how to pack on canned or freeze dried food, but can definitely encourage you to go hunting or fishing. In fact, if you don’t have any experience hunting, we would advise you to try fishing. This is why you will definitely benefit from having a fishing cord or even dental floss. If you make a primitive fishing rod and attach the fishing line to it, you only need patience and some skill set to catch some fish and have some dinner tonight. Any item that may help you fish successfully would be great, as long as it’s not too bulky or heavy. If you believe that an item is important, but you’re worries about its weight, try to find a substitute to that item, which is much lighter and more compact. And of course, practice fishing before you go camping. In case your camping trip is linked to fishing with your kids, then there’s no need to worry about your dinner. 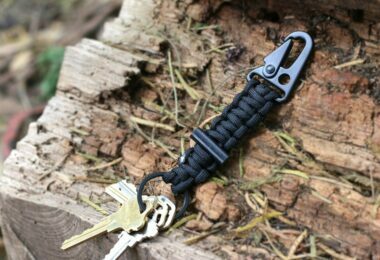 Of course, the pocket knife is yet another vital tool for survival. It’s present in almost any backpack – from the casual hiker/trekker to the hard-core survivalist. The pocket knife has many uses. You can skin an animal and clean fish. You can cut ropes or cords, or even make a bow or any other wood tool. You can clean branches off a tree. And of course, you can defend yourself from wild aggressive animals. While we don’t support needless attack on any animal, an angry bear or a hungry wolf pack calls for serious measures. 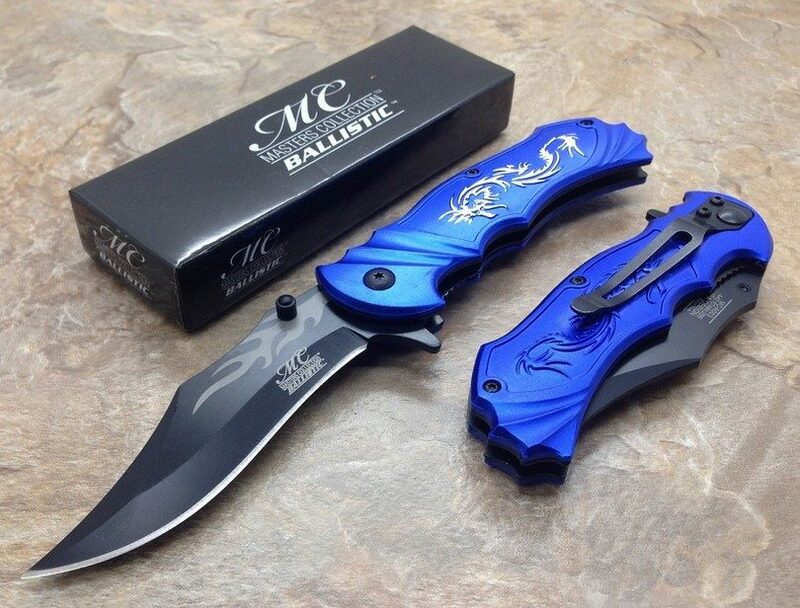 Use the knife only when your life is at stake and when we’re talking about a life-or-death situation. Finally, even if you’re car camping, don’t forget to prepare backpacks. All family members must have at least one backpack. If you decide to go exploring the area nearby, you can use the backpacks to store some water, clothes and signaling devices in case an incident occurs. You should never go out in the wild without a backpack ready to be used at any time. The ideal backpack should be able to fit all the above items. Optionally, you should be able to cram in it the bare essentials like navigation items, water, blanket, signaling device, knife, flashlight and tools for starting a fire. In case you get lost, you need to be able to provide warmth and shelter while the others are searching for you. The flashlight and fire-starting tools are optional and necessary if you go hiking before dusk. Matches and tinder are also a-must if you’re camping during cold weather. Never go anywhere without them. Optionally, you can always keep them in all the available backpacks, so you don’t have to specifically pack them before you go exploring.